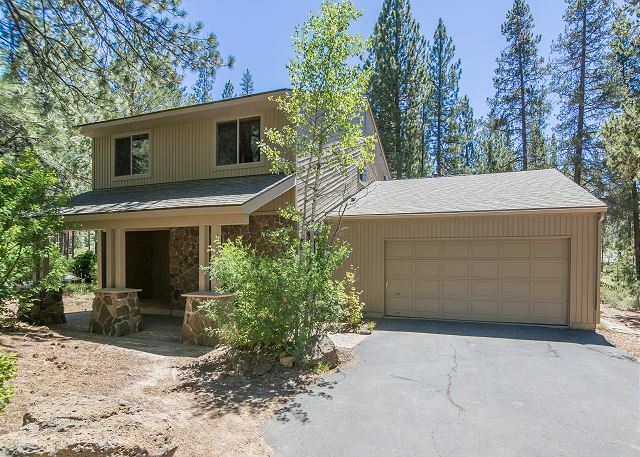 Woodland Lane #6 is located within walking distance or a quick bike ride to Sunriver Lodge or the Sunriver Village Mall. 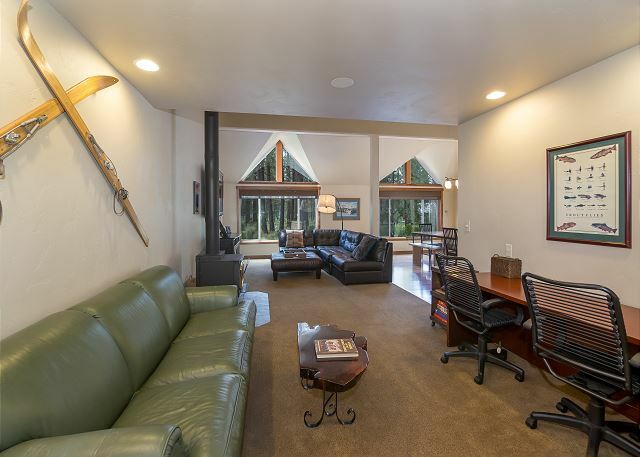 This home has modern furnishings and an expansive living area with vaulted ceilings and large picture windows to sit and watch the wildlife. 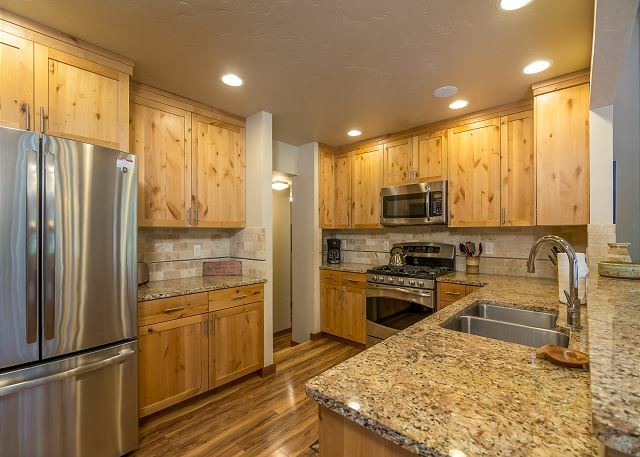 The kitchen is well equipped and has a gas range & granite counters. 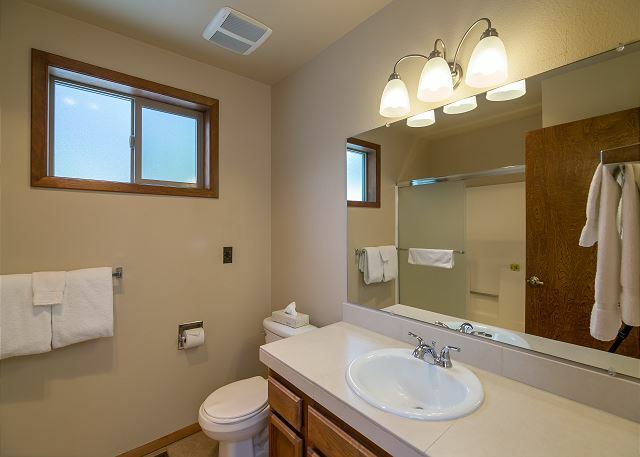 This 4 bedrooms, 3.5 bath home has two master bedrooms one upstairs and one downstairs. 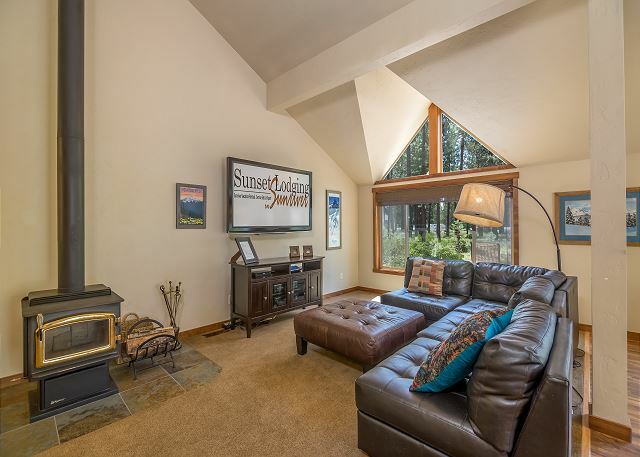 After a long day warm yourself sitting next to the woodstove and watch a good flic on the big screen TV or relax in the private hot tub and star gaze. 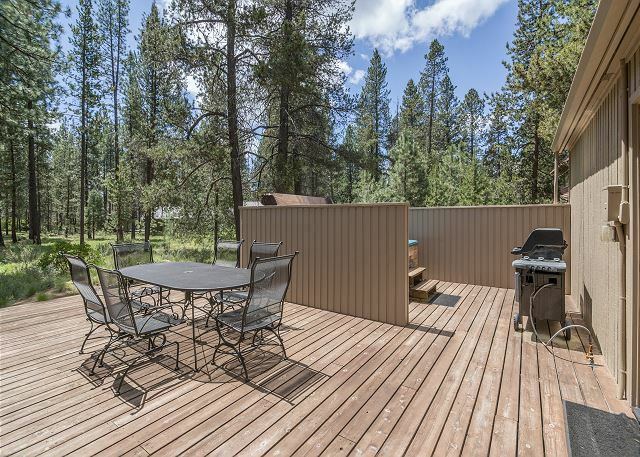 There is plenty of room to spread out in this home from the large living area to the large back deck. 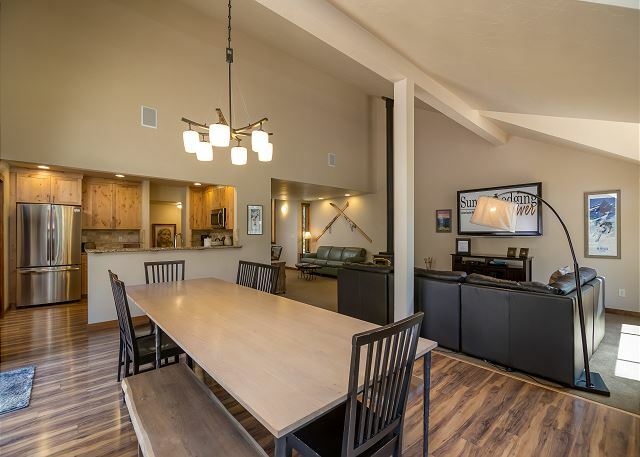 This home provides 10 Unlimited SHARC passes, free tennis and free access to the Sunriver Marina! Room enough for three families to be comfortable. Beautiful weather for biking and swimming, stargazing and watching the wildlife. Thank you for your review, Virginia! So glad that your group was comfortable and that you had beautiful weather as well! Come back soon! The house was very clean. We made dinner several nights and had everything we needed. We enjoyed the house very much and would stay here again in a heartbeat. Thank You for the 5 star Review, Jeremiah! We are so glad to hear that you enjoyed the home and found it clean and having all that you needed! Come back soon! Total of 8 adults and 2 kids under 10. Plenty of space for everyone. 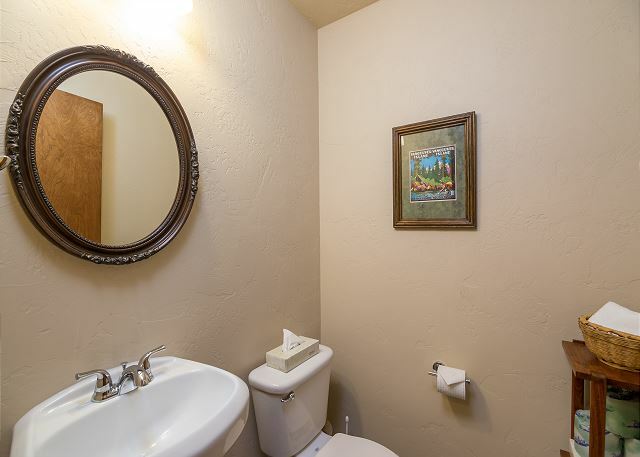 3.5 bathrooms was a big plus. Also having an electronic key lock for the front door was very convenient as most of us arrived outside of normal working hours. The house had easy access to the village and the bike paths. 2 of the bikes in the garage had flat tires, but wasn't an issue for us since there were plenty of bikes. Would have been nice to have 1 or 2 kids bikes. Thank You for the 5 star Review, David! We are happy to hear that the group enjoyed the stay at Woodland #6, we hope to host you again! Thanks so much for the review Tami!! We really appreciate it! For future, any time during your stay that you need anything (more fans etc.) we are happy to bring them out to you! Thanks again on the great review! We had a very enjoyable time. The house was perfect for us. We didn't know though that there was not AC. The lovely nights were cool and very much appreciated on the porch and in the hot tub. We also utilized the bike buggy and and all the toys in the garage. The lacation of the house was perfect too. Thank you for your review Pam! 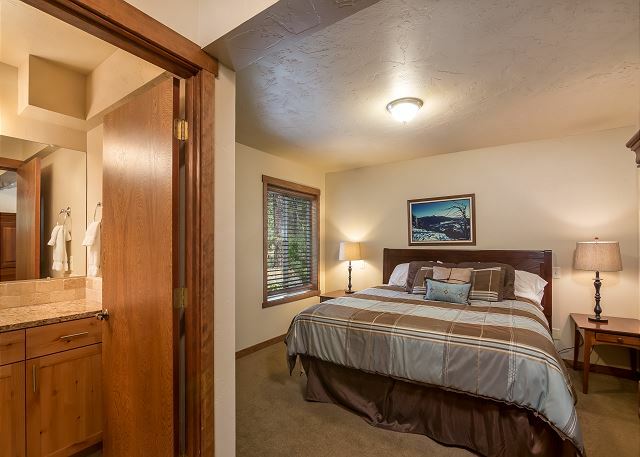 We're glad you enjoyed your time in Sun River at Woodland Lane #6. 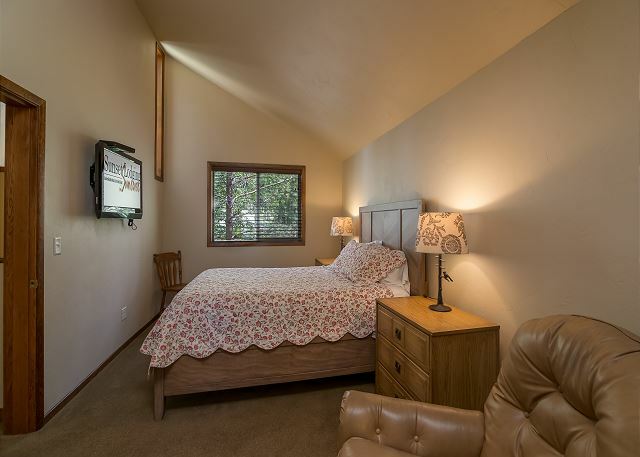 Most homes in Sun River do not offer A/C, but the cool nights allow guests to open the windows to cool down the house. If the windows are closed in the morning, the home usually stays cool during the day. We're glad you enjoyed the hot tub as well, it's a favorite all year long! Was a great spot for our 4 day stay. Loved the fireplace and hot tub!!! Great location near the village. Hi Gary! Thanks for the review! We love the location of Woodland Lane 6 too! Come visit us again soon! Exceptional Staff were very kind and helpful-house was very clean and tidy and well supplied. Except for one of the bedrooms really being too small for a Mom, Dad and young child, everyone else(9 of us all together) was quite comfortable-plenty of room for large dinners,etc- and the perks (discounted lift tickets and shuttle to the mountain) and complimentary SHARC passes are "over and above" all else !! !Harley, our large Lab was also more than thrilled with his basket of toys and I do hope they were for him to take home-he LOVES all of them ! !Thank You !!! We'll BE Back !!!!! We're so glad you enjoyed Woodland 6, Sandra. And we hope to have the chance to host you again on your next visit to Sunriver, which we also hope will be soon! Thanks kindly for taking the time to offer a review of this beautiful home. 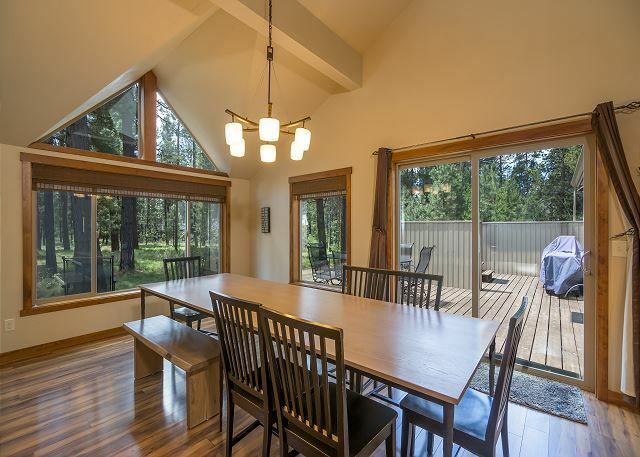 We hope it will encourage more guests to spend their Sunriver vacations there! This is our 2nd yr @ this home. We're already reserved for 2017. It works well for our 2 grown children's families with Papa & Nana. The Sharc passes are great. We do have a request. 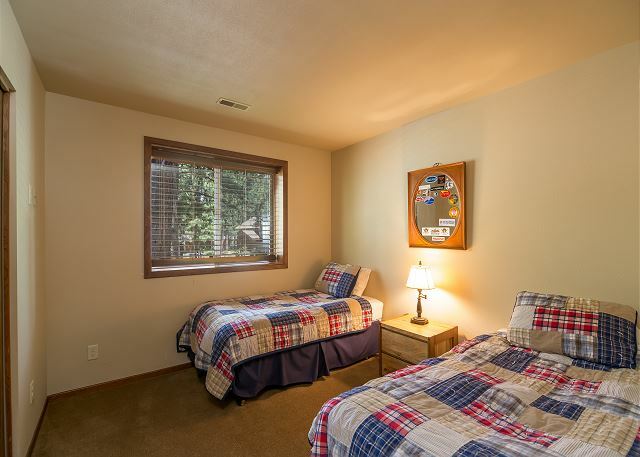 The bedroom with 2 twins would be better set up with a queen bed instead. Outstanding location and very well furnished. 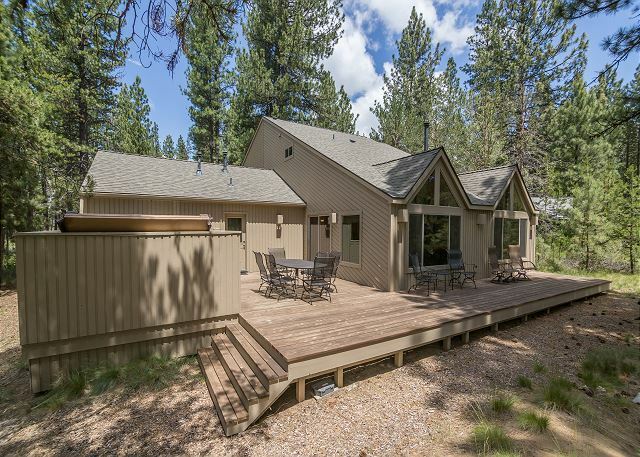 Will request this home on my next visit to Sun river. Thanks Blaine!! Don't forget to get your Summer Rebooking Special for your next visit! Ask your reservationist for details. Everything was terrific. My only recommendations would be to add one or two bikes for kids in the garage, and include instructions for the complex TV/cable system (there were like 5 remotes!). Also, we found it odd that we were not able to lock any of the bedroom or bathroom doors from the inside. Other than the above, everything else was really nice! Thanks for this feedback Erik! We have been tinkering with instructions for all of the homes on remotes, however, they change often, get lost and replaced, etc. and so they become a bit of a 'moving target'. ANYtime you have those kinds of issues while you are here, PLEASE give us a call - our maintenance guys are happy to come out and run you through how they work. We hope to get the chance to host your family back at Woodland 6 soon. Thanks again for taking the time to give us your valuable feedback! We stayed in this home last year and loved it so much we returned again this Year! This house is well maintained and comfortable for ten. The open living area is great for everyone to gather. Love the location. Will definitely be returning next summer! Gloria - these are far and away our favorite reviews!! Our main goal is to become a family tradition, and it looks like we've hit gold with the Richens! Quite often we reflect on our blessings to live in such a beautiful place and we've determined that representing homes like Woodlands 6 and offering them to other families for their vacations is a small way to share these blessings. We're SO GLAD you enjoyed your visits and we are counting the days until you return! We enjoyed the Woodland 6 house very much. We had 5 adults and 2 toddlers and there was plenty of space to spread out. We cooked in a lot and the kitchen was well equipped. The closeness to the Mall was great. Beautiful setting. Deer came right up to the yard everyday. So fun! YAY! Thanks for the privilege to host you and your family at Woodland 6, Greg. We hope to see you back in Sunriver soon! We absolutely loved this home! The house easily accommodated 9 of us who came down to participate in the Pacific Crest weekend. We were easily within walking distance to The Village. The SHARC passes were a big bonus and we enjoyed using them every day. The home lacked nothing - very clean, plenty of room for everyone, the kitchen was well stocked, board games, towels, extra linens, bikes, helmets - everything!! I highly recommend staying at Woodland Lane #! We love our Pacific Crest guests!!!! 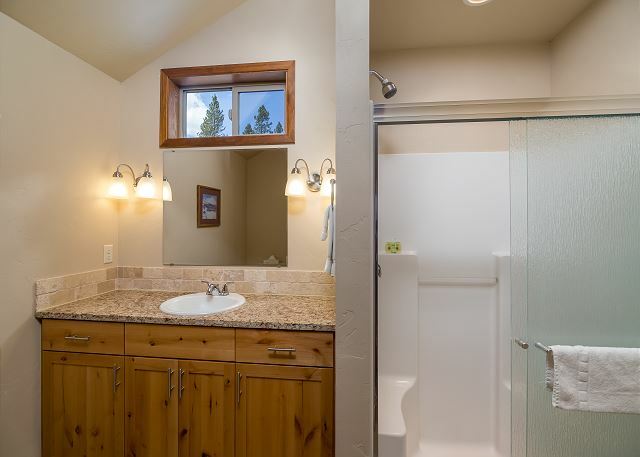 Thanks for your observations on Woodland 6 Cheri, we hope you'll get back to Sunriver soon! AWESOME!!! Thank you, Gloria - this makes the hard work very worth while! 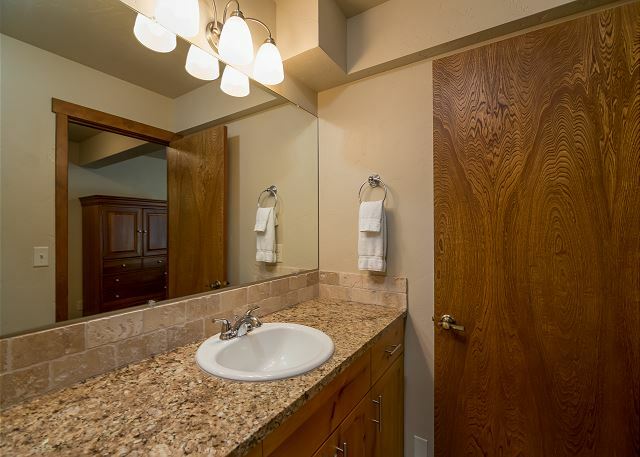 Hurry back to Sunriver rand Woodland Lane 6! One of the best vacation experiences I have had. The home had every amenity you could ask for and more. The SHARC passes were also wonderful. The whole family enjoyed our stay there together. Very spacious nice and cozy home with everything we could ask for! Very close walking distance to mall. We loved this home and will rent again. Thank you! The only recommendation that I have would be a request for written instructions on how to use the remote controls! There were at least 5 remote controls for the living room TV; we never did figure out how to get TV channels but did enjoy the DVDs and Netflix. Thank you for your suggestion Dana! We will address the remote instructions, or lack thereof. We are so glad to hear that you enjoyed Woodland 6, its a wonderful home to spend time in and we hope you will visit us again soon! Two families (4 adults, 4 kids age 9-12) and two dogs loved this house. 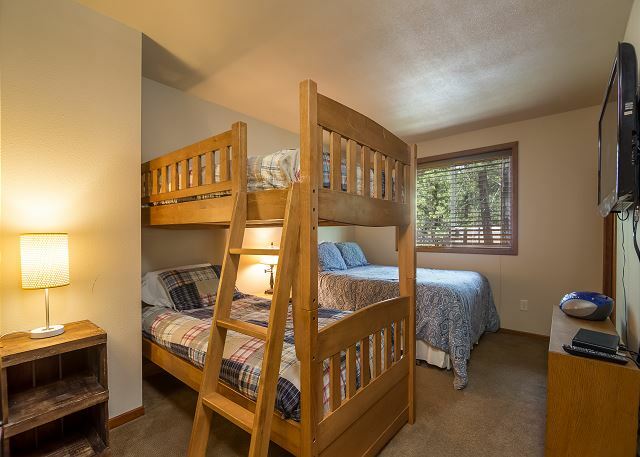 There are 2 master bedrooms and plenty of beds for kids. The kids had a blast riding around the circle (remember to stay out of the middle for ground restoration) on bikes. Easy access to the path and close proximity to the Village/Sharc/River Loop trail made this house perfect. Multiple tvs were a plus since we had 2 days of freak thunder/lightening. Our WiFi wasnt cooperating but the management office connected me to the Cable Co and they quickly rebooted the system and everything worked. We will come back to this house! Thanks so much; we had a great stay at your house! The layout is conducive to visiting with family and the deck is large enough to accommodate a group. This is a great house in a perfect location; very well equipped. The deck was excellent--loved the comfortable social seating. It was very hot in the upstairs rooms--a few fans would be great for the times that it's especially hot. Overall would recommend enthusiastically. From point of contact to checkout, our experience with Sunset Lodging has been nothing short of exceptional. This home was more than we expected. Everything explained about the property was exact. Upon arrival, the home was immaculate. Normally I re-clean the entire house. However, this time...I actually could relax and enjoy everything! We loved the layout of the home. The furnishings were fantastic as well. From the SHARC to whitewater rafting (Sun Country Tours) to hiking the Benham Falls, our stay was amazing! I highly recommend this home. Sunset Lodging was easy to work with, and very nice. The home was well appointed, and an easy walk to the villiage. It's also easy to get to from Highway 97. This was perfect for our group of 6, although I suspect a group of 8 would work well also. 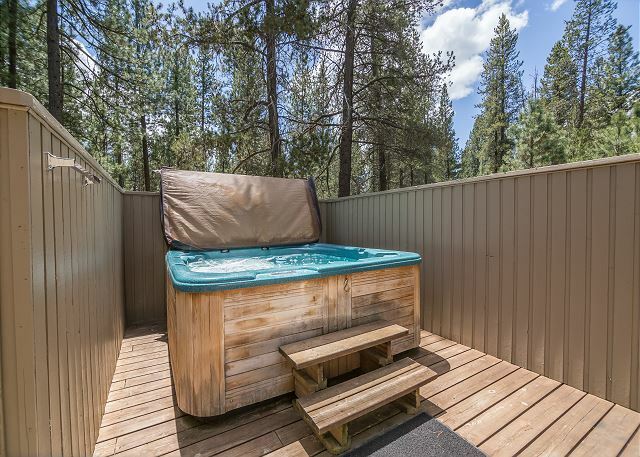 Bikes, hot tub and other amenities appreciated. The gals at the office were great to deal with. My name is Cindy, not Ciny, so I'm choosing "A guest from Wenatchee, WA for my display name. Sorry we got your name wrong sometimes our fingers get to working too fast. We hope to see you in Sunriver again soon! Great location. House was well maintained and very clean! Bikes were not in great shape. 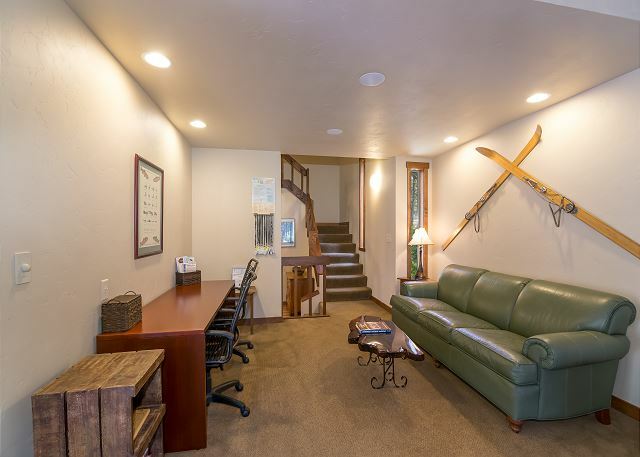 We hope that you enjoyed your stay in Sunriver, come back and see us again soon!